Baylor University's Hankamer School of Business provides a rigorous academic experience, consisting of classroom and hands-on learning, guided by Christian commitment and a global perspective. Recognized nationally for several programs, including Entrepreneurship and Accounting, the school offers 24 undergraduate and 13 graduate areas of study. To accommodate the growing needs of the healthcare industry, the Baylor EMBA Program now also offers an EMBA in Healthcare. Baylor University's Hankamer School of Business provides a rigorous academic experience, consisting of classroom and hands-on learning, guided by Christian commitment and a global perspective. Recognized nationally for several programs, including Entrepreneurship and Accounting, the school offers 24 undergraduate and 13 graduate areas of study. To accommodate the growing needs of the healthcare industry, the Baylor EMBA Program now also offers an EMBA in Healthcare. 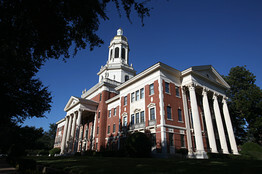 Want more info about Baylor University, Hankamer School of Business Executive MBA? Get free advice from education experts and Noodle community members. What’s the benefit to two separate locations in Baylor University’s Executive MBA program?